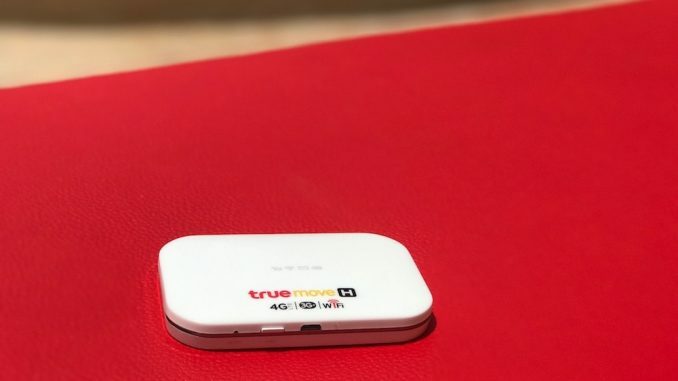 I wanted to share my story and experience of buying a True Move Pocket Wifi in Thailand. In fact it’s not so much that I wanted to, I felt I had to after such an amazing comedy of errors trying to get the bloody thing working in the first place. First and foremost, don’t buy anywhere. I really can’t state this enough. There are a ton of places that you can buy this little contraption from, but you really don’t want to. What the lovely people at Banana (it’s a tech shop that ironically sells Apple stuff too) forgot to mention or explain properly was that even after I bought the device, with a sim that comes with, I wouldn’t be able to use it as the device needs to be activated. After 3 days of popping in to every 7 Eleven I went past, going back to the big Tesco Lotus and even trying the Big C supermarket, I finally understood that I needed to go to the True shop, which people had been trying to tell me. The only issue was I had never understood where the heck they were trying to send me. Having tried to put credit on the device’s number, trying to find somewhere online that could help, and even searching YouTube videos to see if anyone had said anything about this, I realised just how awful this experience was becoming. Finally I had some luck. A rather unimpressed, and not happy to be working or helping me out “lady”, who wrote down the name of where I could go. So it turns out that you can go to Central Festival Samui, which is a shopping centre, not a festival/event place like I had originally thought when I saw the signs. The real True shop is just like any mobile operator store back in the UK or anywhere else I’ve travelled for that matter. They sell the device for the same price, 1,990 BHT (approximately £50) but they will activate it there and then. They will even add the package you want for data. 8 GB for 750 BHT (approximately £16). Take your passport, or you’ll be back. Yes, the calamity of errors was still going on as you need to have a passport to be able to make this transaction happen. Thankfully I had mine with me on the day (by chance not planing), but I can easily envisage people not knowing and getting there just to find out you need to go back to your hotel to get it. In the shop they will activate and make sure you are up and running. Test the device, connect to it before you leave the shop. It sounds silly, but after a while, going up and down to these shops can become really tedious. Top up there and then. The data bundles they offer are either for 7 days or for 30 days. If you are in Thailand for a while, get it for the 30 days just in case, and again, you can choose how much data you really need. It works everywhere I’ve been so far (Koh Samui, Koh Tao, Krabi, it even works on the boats and long bus rides). TIP: Something to bear in mind is that this works as a WiFi hotspot for your phone. What this means is, your iPhone will think it is connected to a normal WiFi connection, and thus it will update things, upload your images etc. More data is advisable because of this. Whatever you do, don’t do like me. I spent the better part of 3 days trying to figure out what I needed to do, online, in different shops etc. Don’t get caught in that trap. It’s remarkably frustrating in the long run. If you want to buy a True Move Pocket Wifi in Thailand, just go to the True shop closest to you and get it sorted from there. It really is the simplest way! You are now you’re own HotSpot! 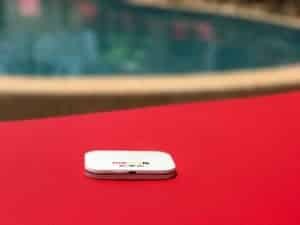 This little sucker means you are now your own hotspot. That’s priceless when you decide to go wondering around, get lost in the jungle, or simply want to work from a beach rather than your hotel room. As I mentioned earlier, it even works on the boats between the islands and pretty much flawlessly on the long bus rides between different locations. I hope this helps all you other Digital Nomads. Don’t want you guys getting stuck out there in the same way I did. Here’s some extra information on Koh Samui for Digital Nomads. Hope it helps! PS: I’m pretty calm writing this email, but that’s because I had to wait just over a week to be able to write it. The first version had more swear words and more insults than I care to admit. I was going mad during those three days. Everyone wants to be so nice and they don’t want to simply say, “NO, I can’t help you!” so what you invariably hear is a lot of “Yes, yes, yes, not here” which doesn’t help you at all. I was sent from a Family Mart to a 7 Eleven, back to Tesco Lotus, back to 7 Eleven and even at one point to a machine that allows you to top up directly (which obviously DOESN’T work when your device and sim haven’t been activated yet)! Now it’s great, life is good and the device works. At the time, I honestly thought about simply throwing the bloody thing in the sea!